Less fights about furniture fitting = a happier home. Is there anything worse than getting home from IKEA only to discover your new chest of drawers won't fit? Then you scream at your partner for measuring the space with his arms instead of a tape measure like a normal person. No? Just us? Anyway, IKEA have solved that problem and many other woes of those trying to furnish their space with the announcement of a new app which lets you virtually place furniture in the room before you commit to buying it. 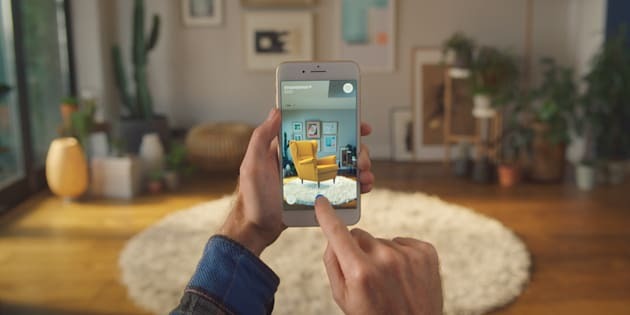 It's called IKEA Place and it uses augmented reality to experiment and then share how your space will look. From sofas and armchairs to coffee tables, all of the products in IKEA Place are 3D and true to scale so that everything is just the right size. Praise the renovating gods. "IKEA Place makes it easier to make buying decisions in your own place, to get inspired and try many different products, styles and colours in real-life settings with a swipe of your finger," Michael Valdsgaard, Leader Digital Transformation at Inter IKEA Systems said in a brand statement. "Augmented reality and virtual reality will be a total game changer for retail in the same way as the internet. Only this time, much faster. ARKit gives us the opportunity to help shape the development of AR as an accessible tool for real-life decision making,"
The app automatically scales products based on room dimensions with an impressive 98 percent accuracy. The technology is so precise that you will be able to see the texture of the fabric, as well as how light and shadows are rendered on your furnishings. While it doesn't contain every single item sold at IKEA, it does feature more that 2000 products. In the future the app will play a key role in the launch of new product lines and the products in the first release are aligned to the living room, which is the focus for IKEA in 2018. IKEA Place will be available to download from the App Store soon (soz, Android).